Heather Courtney won an Emmy, the Independent Spirit Truer Than Fiction Award, and a SXSW Jury Award for her film WHERE SOLDIERS COME FROM. The film has won awards at festivals around the country, including Best Documentary Feature at the Philadelphia Film Festival, the Founders Award for Best U.S. Documentary at Michael Moore's Traverse City Film Festival, and Critics Award at the Sebastopol Documentary Film Fest. The film received rave reviews in the New York Times, the Washington Post and others during its theatrical release in Fall 2011, and was broadcast nationally on the PBS program POV. It made several Top 10 film of 2011 lists, including Salon and the Austin American Statesman. WHERE SOLDIERS COME FROM was supported by many grants and fellowships during its production including from ITVS, the Sundance Documentary Fund, and the United States Artists Fellowship. Heather was also a fellow at the Sundance Edit and Story Lab. Prior to WHERE SOLDIERS COME FROM, Heather Courtney directed and produced several documentary films including award-winners LETTERS FROM THE OTHER SIDE, and LOS TRABAJADORES, and as a co-director on Roger Weisberg’s documentary CRITICAL CONDITION. Her films have been funded by a Fulbright Fellowship, the Paul Robeson Fund, and the Texas Filmmakers Production Fund. LETTERS FROM THE OTHER SIDE was the Closing Night film at the Slamdance Film Festival in January 2006, and was broadcast on over 60 PBS stations. LOS TRABAJADORES won the Audience Award at SXSW and the International Documentary Association David Wolper award, and was broadcast nationally on the PBS series Independent Lens. Prior to receiving her MFA in Film Production, she spent eight years writing and photographing for the United Nations and several refugee and immigrant rights organizations, including in the Rwandan refugee camps after the 1994 Rwandan genocide. Heather is from the beautiful Upper Peninsula of Michigan, and is proud to call herself a Yooper. Jeffrey Schwarz's previous films include HBO's Vito, about the beloved gay activist and film scholar, Spine Tingler! The William Castle Story, about the legendary Hollywood showman, and Wrangler: Anatomy of an Icon, on 70s adult film star Jack Wrangler. He is currently in production Tab Hunter Confidential, about the 1950s screen heartthrob. Paul Stekler’s documentaries about American politics have won numerous national honors including multiple Emmys, Peabodys and du-Pont-Columbia Journalism awards. His films include Sundance Special Jury Prize winner George Wallace: Settin’ the Woods on Fire (directed and produced with Dan McCabe. it aired on PBS's The American Experience), Vote for Me: Politics in America (directed and produced with Louie Alvarez and Andy Kolker. it was a national PBS two night special), Last Man Standing: Politics Texas Style (which aired on PBS’s P.O.V. series), two of the Eyes on the Prize civil rights series films, and Frontline’s The Choice 2008, about the Obama-McCain election race, which he co-produced and wrote with director Michael Kirk. 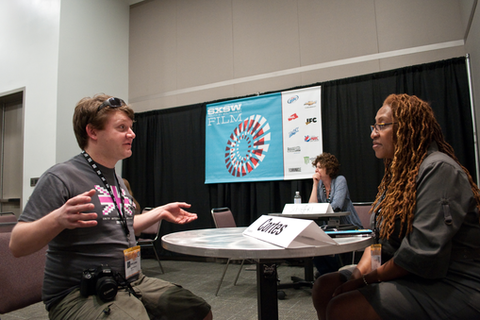 His latest film, Getting Back to Abnormal, an ITVS funded film about New Orleans and race relations after Katrina, made with Alvarez, Kolker and Peter Odabashian, will premiere at SXSW 2013. Dr. Stekler has a doctorate in American politics and worked as political pollster in Louisiana. He lives in Austin where he teaches documentary film production and is the Chair of the Radio-Television-Film Dept. at the University of Texas.